I used a sketch from Cricut Fanatics for the layout. The flower was cut from Formal Occasion. I love the colors on the Citrus paper. I just bought it yesterday during my lunch break, and I had to use it right away. I used glitter glue all over the rose and added a little ribbon bow. I've had that ribbon for almost five years (crazy!) and I have just a bit of it left. Then I added a few gems inside and out. The sentiment inside is from Simply Charmed. Evelyn, you always come up with great cards and so glad you entered at Exploring Cricut. Great Mother's day card, thanks for playing @ CTO! 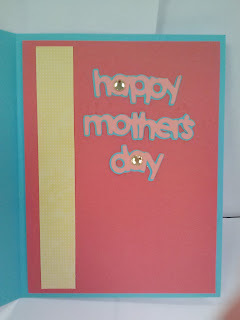 What a pretty Mother's Day Card! 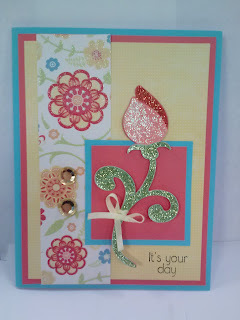 Love the glittery flowers and your paper choices. Thank so for joining us at BBTB2 this week. Love the bright colours Evelyn and the touch of sparkle, perfect. Men huh? You'd think they'd remember their Mothers! lol Thanks for joining us over at LRW this week. Love the glitter glue-personally I think you just can't go wrong with lots of sparkle! And the paper is VERY pretty! Glad you joined us at BBTB2 and Exploring Cricut this week. Love the bling. Thanks for playing along with FCCB. Evelyn I love all the bling and glam on this card, great color combo too! I LOve the sparkle and your colours are GOrgeous. A LOVELY card. A wonderful job!! !Love it! So pretty and love the glitter flower. Thanks for joining us at BBTB2. Beautiful flower and paper. Makes a beautiful card. Thanks for joining us for the Mother's Day Challenge at BBTB2. So wonderful of you to remember your mil. Such pretty paper and colors. Love the glitzy rose! Thanks for sharing at BBTB2. I'm loving the glitter, great card. Thanks for joining us at Cut It Up. Great card! Thanks for joining us at My Sheri Crafts! 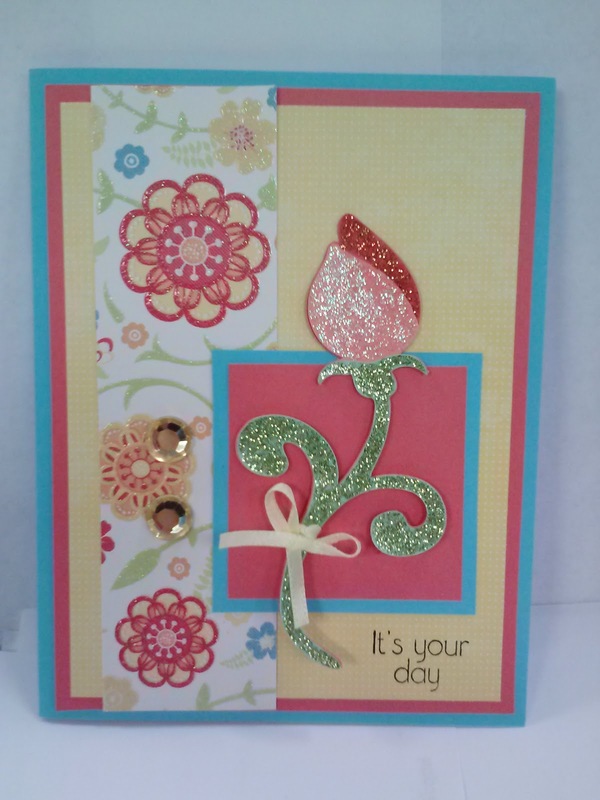 Thanks for sharing your cute card on Tuesday Throwdown! This is really pretty, I like how the flower coordinates so well with the pattern paper!! Thanks for joining our FCCB Mother's Day challenge this week!! Great card! I love the bright colors and the glittery flower! Thanks for joining us at FCCB!! Lovely card! Thank you for joining our Corrosive Challenge this fortnight. I want to congratulate you for using your very newest and very old craft supplies in the same project!! That's got to be a record! I love the colors on your card, and that patterned paper is gorgeous! Thanks for joining us at Cut it Up Challenges! Lovely card. It's a good thing that your hubby has you to help him out. Thanks for playing along with Little Red Wagon. What a cheerful, shiny card, fabulous design! Thank you for joining us at the Celebrate the Occasion challenge and hope to see you back again. Lovely Mother's Day card! Thanks so much for joining us this week at The Pink Elephant! Such a beautiful card I am sure you MIL loved it!! I just love,love all that sparkle. Thanks for joining us at FCCB!!! Very pretty card! The glittery flower is beautiful! Thanks for playing at My Craft Spot! Fabulous card! Love the sparkly rose! So very pretty! LOVE the glitter! Thanks for joining us this week at My Craft Spot!!! lovely glittery rose - perfect for Mother's Day! 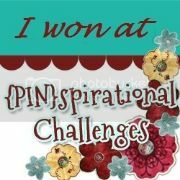 Thank you for joining the Sketch Challenge at Cricut Fanatics!